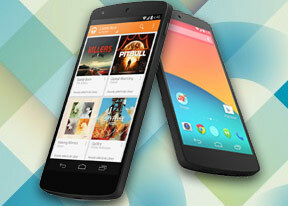 Google Nexus 5 is the first smartphone to run on Google's latest Android 4.4 KitKat OS. Just like the previous Jelly Bean iterations, KitKat doesn't bring any game changers. Instead it polishes further the user experience, overall system performance and experience, plus brings along some handy system app updates. For example, Android KitKat comes with the latest Hangouts app that combines SMS, MMS and Gtalk chats into just one single app. It also introduces a new powerful Phone app and an even easier way to interact with Google Now. First things first though, here is our traditional video walkthrough to get you started. The lockscreen in Android 4.4 KitKat features the same large dotted circle around the center-placed padlock button. Lockscreen widgets remain unchanged and are full-screen, resizable tiles, one of which is always visible at the top of the main lockscreen, above the padlock icon. The rest are a right swipe away. The widget on the main lockscreen is collapsed to make room for the padlock button, but can be expanded to display additional information. There are a few stock lockscreen widgets: Messages, Calendar, Gmail, Digital Clock, Google Now and Google+. The camera shortcut, just like before, is a left swipe on the lockscreen. Lockscreen widgets are resizable - tap and drag down to expand and show more content, if available. Lockscreen widgets can also be reordered by tapping and dragging, so you can choose which one is visible on the main lockscreen. They can also be dragged up to discard. There are multiple unlock patterns to choose from: simple slide, pattern, pin or password, and face unlock. The lockscreen could even be skipped altogether. Once unlocked, you're get welcomed by the new homescreen interface. Even though it looks quite familiar, you'll immediately notice the new redesigned and bigger icons on a new colorful wallpaper. The app drawer shortcut is also different. Android 4.4 KitKat brings a brand new homescreen - Google Now. It is always the leftmost pane on the homescreen. You can't set it as a default homescreen but you can turn it off if you like, just like the BlinkFeed on the HTC One lineup. The bottom of the screen is reserved for the three navigation controls: Back, Home and Recent Apps. The dock is customizable and features two shortcut icons on either side of the app drawer key. You can have folders there, each with multiple shortcuts. Google's Daydream is available on KitKat, too. Once turned on, you can set it up to show photo albums, the latest news from Google Currents, the clock or a somewhat childish Android KitKat animation with colorful squares when the device is either docked or idle. The notification center is the same as before and Quick toggles are available. They're accessible via an icon in the top right corner of the notification area. You get access to key device settings such as brightness, Wi-Fi, Bluetooth, location, mobile networks and Battery. Some toggles are directly accessible shortcuts to their respected functions in the settings menu. The quick settings menu can be accessed by a two-finger swipe down from the top of the screen. Your name and photo are displayed in the toggle area as well, but only after you've logged in to Google+ account or after you've manually set them yourself. Notifications can be expanded and collapsed with a downwards swipe, and the top one is expanded by default (if the app that put up the notification supports it, of course). The homescreen consists of just two panes - Google Now and the default one with a bunch of shortcuts. You can add more once you start putting widgets, shortcuts or folders. You can add as many panes as you want (we gave up at a total of fifteen). The widgets are no longer part of the app drawer. You can access the widget list only by a tap and hold on an empty space on the homescreen and selecting the dedicated Widgets shortcut. We prefer this way of handling the widgets, because they don't get in the way of the day-to-day work with the app drawer. Most of the widgets are resizable in all directions in order to fit into any tight space. To resize a widget, you tap and hold and then release. Four handles will appear on its sides, allowing you to change the widget's size in the direction you want. Folder functionality hasn't been changed since Ice Cream Sandwich and functions as you'd expect. A folder is created by dropping an app shortcut on top of another shortcut and can be named by tapping on the "Unnamed folder" label. Opening a folder expands it only as much as needed to show the icons inside. The folders icons themselves are circular with several individual app shortcuts stacked on top of each other. They are lined up so the first shortcut in the folder will be the only one unobscured - the rest of the icons are nearly impossible to tell apart. The app drawer of Nexus 5 consists of 5 rows of icons on side-scrollable pages. That's it - no Play Store dedicated shortcut, no tabs and no widgets. And this time around the app icons are big, and we mean BIG. Just check the screenshots below. The apps are ordered alphabetically and there's no other sorting option. Come on, Google, is this too much to ask? There is no option for manual re-arrangement and newly installed apps take up a spot in relation to their respective alphabetical order instead of getting placed in the end of the list, which would have made them easier to get to. Placing a shortcut on the homescreen works as you would expect: press and hold to grab it and then position it on the homescreen pane of choice. Two more options appear at the top of the screen while you're dragging - Uninstall (to quickly remove apps) and App info, which opens the application's entry in the Manage applications list. Last but not least, the Recent Apps list has remained virtually unchanged. It would be nice if Google finally adds a kill all/close all option. As a whole, Android 4.4 Kit Kat offers a polished and smooth user interface and coupled with the top of the line chipset, operation is lightning fast all the time. We'll explore the performance further in our dedicated benchmark section. The Android 4.4 tweaks don't end here though. Follow us, as we continue to explore. Next up, Google Now.